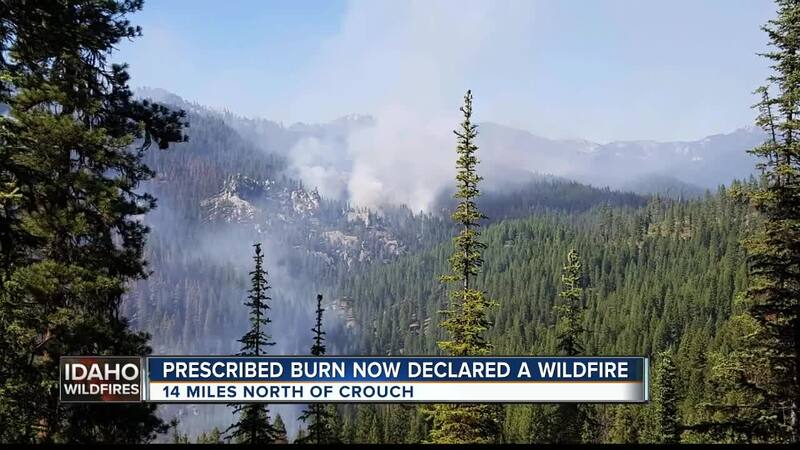 With fire danger high across the west, fire crews near Crouch are hoping to make progress on the Lodgepole Fire that started as a prescribed burn. The fire is roughly 1,600 acres and 25% contained. Officials are worried about smoldering heat expanding to dry brush and expanding the size of the fire beyond the project boundary. Emmet District Ranger, Richard Newton, says the hot weather isn't helping firefighters on the ground. “We have been actively engaged in fighting this fire for about two weeks now with all of the resources at our disposal, but with the anticipated future weather, difficult terrain, and challenges obtaining additional fire-fighting resources, I have decided to declare this prescribed burn a wildfire,” said Newton. There are several red flag warnings in place across southeastern Oregon and southwestern Idaho, which could make things more difficult for the 113 firefighters on the ground fighting flames. Crews are hoping the extra resources will help firefighters keep the fire within its intended burn area. “To date, the fire has remained within the original planning unit and we are doing our best to keep it there. Declaring this burn a wildfire will give us more tools to ensure the fire stays where it is supposed to be," said Newton. The fire has prompted two temporary road closures. That includes NFS road 671B1 and 671A, both of which are signed on the ground. Officials say an area closure will likely happen in the near future and ask the public to be careful of fire traffic if they are traveling to Silver Creek Plunge. Firefighters are actively engaging the fire. Helicopters are dropping buckets of water on hot spots; hand crews are digging line, reinforcing hand lines. The smoke from the fire is starting to settle into Crouch, a town about 14 miles away from the fire.